Arbor pergola or pergola arch. Two plans in one! A beginners step-by-step guide on how to build either a beautiful walkthrough pergola arch or a fantastic arbour pergola. These plans will show you how to build a wonderful pergola or arch. It's also easy to adapt the plans to create a beautiful seated arbour. Build the arch, pergola or arbour to match, positioning them in different parts of the garden, for a co-ordinated look to the whole design. Follow the beginners, detailed, step-by-step instructions for an easy and inexpensive way to make your garden a beautiful and relaxing space. Add stunning climbing plants to make it even more special. 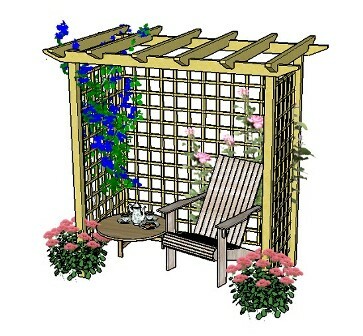 Includes 18, free, ready to use, pergola rafter tail templates, which help to create a unique and beautiful feature!